Night Vision vs. Thermal Imaging: Which is Better? Are you wondering about the difference between night vision vs. thermal imaging? Here's what you need to know about how they work and the pros and cons. Since before World War II, humans have been trying to improve our ability to see in uncertain situations. Whether we're trying to see a deer hiding in some brush or find an enemy lying in wait, we have worked to see through obstacles such as darkness and cover. This has resulted in two primary technologies: night vision and thermal imaging. Both night vision and thermal imaging allow you to see something you otherwise wouldn't be able to. These technologies are popular with hunters, military personnel, and more. Read on to learn more about night vision vs. thermal and which is the best choice for you. Night vision has been in use since World War II when the military developed it. It involves a very high-sensitivity camera that can pick up on the smallest amount of light. Intensifier tubes magnify the contrast that little bit of light provides so that the human eye can distinguish shapes as normal. Although night vision can work off of light as faint as that provided by the moon and stars, it does need some light. This means that if you are in a building, or if it is a cloudy night, night vision may not be as effective. IR illuminators are available to overcome this problem, but they can have their drawbacks, as we will discuss later. Night vision simply turns up the contrast on dark areas so humans can see more clearly. But thermal imaging uses a different spectrum of light entirely to create an image. Rather than working off of the visual light spectrum, thermal imaging uses heat. Areas that are warmer (people and animals, for instance) generally show up in shades of red or white; areas that are cooler show up in blues or blacks. Thermal imaging has improved over the last few years so these devices can see smaller temperature differences. Some of the latest models can detect differences less than a tenth of a degree Celsius. Unlike night vision, thermal imaging can work in absolute darkness. What Are the Uses for Night Vision vs. Thermal? Both night vision and thermal imaging are used in military and hunting operations, as well as a variety of other applications. 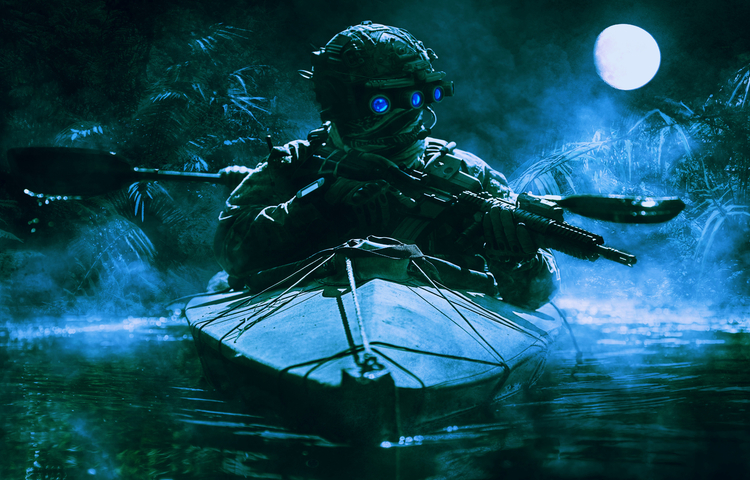 Night vision is often used in situations where the temperature difference isn't very great, such as a summer night, or the user wants a tactical advantage. In military situations, an operative being able to see in the dark when his or her target can't is a major bonus. Thermal imaging is most useful when there isn't any visible light or the user is trying to work around camouflage. Firefighters sometimes use thermal imaging to see through smoke or steam to find people and animals trapped in burning buildings. In some cases, thermal imaging may even be able to see through walls or find people hidden behind objects. What Are the Strengths of Night Vision? One of the biggest advantages of night vision is the tactical advantage it can provide. As we said, being able to see in the dark when your target can't is very useful in military situations. It can also be used to identify targets from a long distance, as some of the newer models are extremely accurate. Night vision can also be great for security cameras and situations when there isn't camouflage or cover to contend with. In scenarios where there may not be a lot of thermal difference (such as in extremely cold conditions), night vision can gain an edge on thermal imaging. And if you're looking to save some money, you can't beat night vision – decent models only run a few hundred dollars, whereas even basic thermal imaging units can run into the thousands. What Are the Weaknesses of Night Vision? The biggest drawback of night vision is its inability to cope with camouflage and cover. Because night vision is an enhanced visual image, it does not see things any differently than the human eye does. This means if something is hiding in the brush, it is as invisible to night vision as it would be to the naked human eye. As we mentioned earlier, night vision requires at least some light to work. IR illuminators can create light that night vision can see, but which is invisible to the human eye. Unfortunately, it is also visible to other people using night vision, making these tools a liability in military situations where both sides have night vision technology. What Are the Strengths of Thermal Imaging? The biggest strength thermal imaging has is its ability to ignore cover and camouflage. In hunting or in military situations, a target can be hidden so well in the area that it is absolutely invisible to night vision and the naked human eye. But thermal imaging can reveal it with no trouble at all. This ability to ignore normal obstacles to vision can be helpful in a number of situations. For instance, thermal imaging has been used in sandstorm rescues, when this technology can see through clouds of sand that helicopters cannot. It has also been used to check energy flow and find thermal leaks in houses. What are the Weaknesses of Thermal Imaging? One of the surprising weaknesses of thermal imaging is its inability to cope with extremely cold situations. For instance, you might think that this technology might be useful in finding victims of avalanches. But it turns out thermal imaging cannot detect human bodies under even a thin layer of snow. The other major downfall of thermal imaging for the average buyer is the price. Thermal imaging is expensive, ranging into the thousands of dollars even at the bottom end of the scale. Finally, thermal imaging is imprecise enough to make identifying potential targets from a distance impossible, where night vision might make identifying them simple. Whether you're a volunteer firefighter looking to make rescues safer, a hunter trying to get more game, or a military operative trying to get an edge, night vision and thermal imaging can be powerful tools. The question of night vision vs. thermal depends entirely on your needs. Each has their strengths, and each has drawbacks in certain situations. If you're looking for the best night vision and thermal imaging tools, visit the rest of our site at Senopex. We are a global leader in thermal technology for both military and civil applications. Check out our catalog of powerful tools today. Previous Previous post: How Does Thermal Imaging Work? Dave on Night Vision vs. Thermal Imaging: Which is Better? Jon on How Does Thermal Imaging Work?